Colour Wizard is regarded as the leading mobile SMART Paint Repair and Alloy Wheel Refurbishment Company in the North West. We are family owned and have been in business for many years. We already operate several highly successful 'franchised' mobile workshops in Liverpool, Warrington and Cheshire. We are consistently chosen by both private customers and dealers over two other national brands in the area because of the professional training of our operatives, the fact that we don’t confuse customers by sending more than one operative into the same territory, the time we take to do a great job and our honest approach to refer damage that is more serious than we could fix with a lasting high-quality finish to a network of body-shops we co-operate with. Colour Wizard® fix small body and paint damage on cars like stone chips, parking dents, scrapes, chemical spots, bird damage, localised rust, dulled paint, cracking paint on plastic parts, damage by vandals, wear and tear and more, using a highly professional repair and painting process at the customer’s home, office or forecourt. We also provide alloy wheel refurbishment services when they are damaged by curb scrapes, age and more. We use a professional process and an advanced wheel machine to provide alloy wheel repairs - again at the customer’s premises. 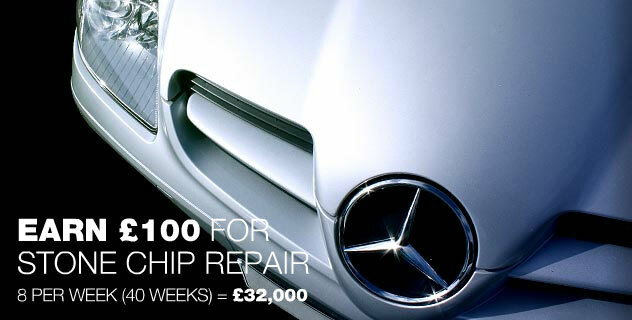 Our average job repairing dents and paint could earn you around £100, for as little as 1-2 hours work and another £80 for an hour refurbishing a couple of alloy wheels. Because you can get both SMART paint repair and alloy refurbishment in the same Colour Wizard® franchise, this means that you have an advantage over our competition that only offers paint. It is natural that a client happy with your paint repairs could also want you to refurbish their wheels at the same body shop. This is a great advantage, because it means that every £100 paint repair job could be turned into a £180 job if you also did 2 wheels or a £260 job if you also did all four wheels. So, you can spend less time earning nothing on the road between jobs and earn more at each job you serve. Colour Wizard clients value our quality and integrity, and keep coming back for more repairs from us and always refer us to friends, family and work colleagues. Unlike some of our competition, we are fastidious in the quality of our repairs and the honest value of our car repairs services. You won’t see our operators’ re-spraying a car in the rain without proper cover or charging our clients to do a half-hearted repair on a panel that would be better replaced. All of our operatives are professionally trained in dedicated training with a proper body shop - not just by watching another Operative on the road who might not have the time to help you learn. This means that every operator we have on the road has a unique pride in the finish that they achieve on our clients’ vehicles and are not satisfied with just ‘getting the job done’. And, because our clients value that quality and integrity, they keep coming back for more repairs from us, which means that you need to spend less time and money marketing once you have built up an initial and loyal client-base. Unlike a conventional body shop, which can cost £200 - £500 per panel or replacing a damaged alloy at a cost from £300 each or much more, Colour Wizard® can carry out higher quality car body repairs in just 1-2 hours and save the client up to as much as 80%. And because Colour Wizard® Franchisees operate from fully equipped mobile workshops, all repairs can be performed at a location that’s convenient to the customer, such as their home or workplace. Which means that our clients can keep their cars on the road or the forecourt with the minimum of fuss.